The Roman God of War has inspired much literature, art and music of a somber and fearsome sort. But if you ignore the dark side for a while, the planet itself is fascinating. It is a lot more interesting than our barren Moon, given that it has an atmosphere, visible surface water, weather and topography on a grand scale. Its surface is clearly visible - in contrast to that of Venus, our other planetary neighbor - and its surface temperature is also a lot less extreme than that of Venus. That said, it is a bizarre world by terrestrial standards, with much to teach us and much that is still unknown. What gets a lot of people excited is the prospect of a manned mission to Mars to unravel some of these mysteries. If you are so inclined, you too can become a member of the Mars Society. Just click away. The celestial mechanics of perihelic opposition - space science article from NASA. Mars factoid page with educational material and links. Part of Bill Arnett's Nine Planets opus. Article by Dave Snyder (of University Lowbrow Astronomers, Ann Arbor, Michigan) printed in Article by Dave Snyder (of University Lowbrow Astronomers, Ann Arbor, Michigan) printed in Reflections, April and May 2001, updated January 2002. April and May 2001, updated January 2002. Information from JPL on NASA's unmanned missions to the red planet. An organization advocating a manned mission to Mars. Large number of articles, links, member activities..
Another comprehensive (and eye-catching) source for all kinds of Mars information. This is a section of the Spaceref.com website. A site sponsored by Astrodigital.org, a collection of educational websites. 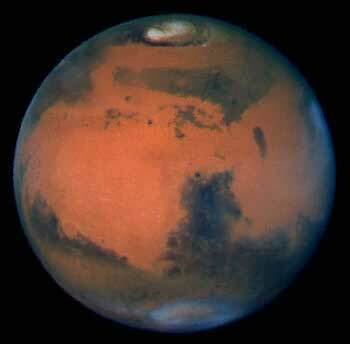 The Explore Mars web site is home to a variety of articles and data tables about the planet Mars. In addition, you can use the A site sponsored by Astrodigital.org, a collection of educational websites. 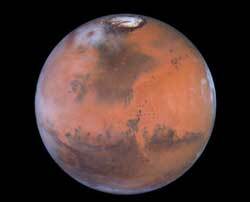 The Explore Mars web site is home to a variety of articles and data tables about the planet Mars. In addition, you can use the Mars Database of Named Features to access basic information on over 1400 named features on Mars. European mission to Mars atop a Russian launcher. Beagle 2, named after Charles Darwin's exploratory vessel, is the lander on the mission. This mission will lift off just before midnight on 2 June 2003 (23:45 local time, 19:45 CEST).